Another post that either disappeared or didn't manage to get posted. Guess the internet was more spotty than I thought. Oh well. This should have been posted somewhere around 4/16/2016. At least this time I found a couple of the pictures for the post. We departed the marina at Lake Worth, where we picked up the batteries, around 1PM. Yes at least this time it was not a multi-week process to replace the starting battery. We made the short trip out the Lake Worth inlet and pointed the boat south once again. We unfurled the sails and put the engines to rest. With the southeast winds, we were set up for a nice beam reach down to Biscayne Bay. 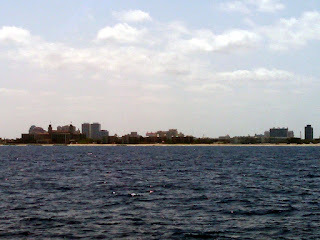 We sailed down the coast, past Palm Beach (and a dozen other towns with beach in the name) Bocas Raton, Ft. Lauderdale, and the Port of Miami. It is amazing how deep and how blue the water is here just a couple miles from shore. 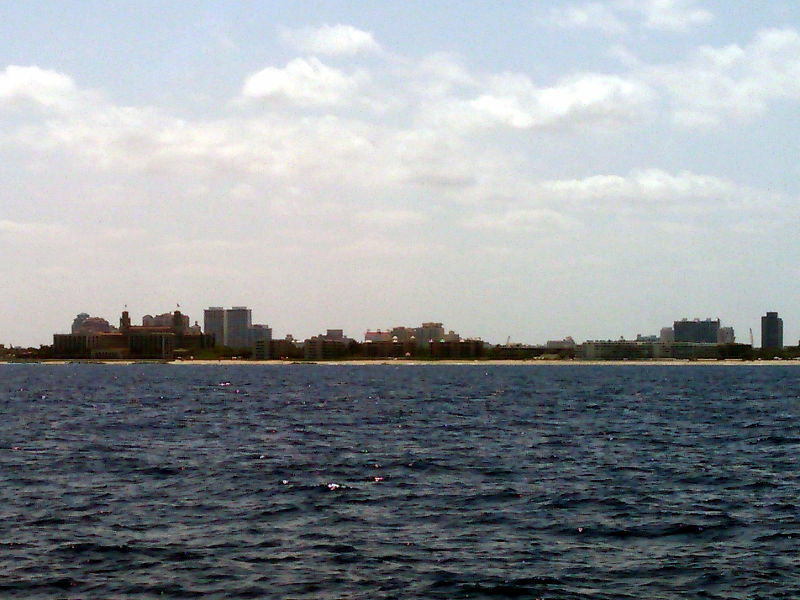 How most of the coast looks...high rises along the coast. As we were passing by Boynton Beach, the Coast Guard came on the radio and said there had been a report of an airplane going down a mile west of the inlet. We kept a lookout, occasionally scanning the sea with our binoculars. Soon a Coast Guard helicopter and a couple small Coast Guard boats were searching the area around us. After a couple hours, as the sun was setting, they gave up the search. Since we were in the area around the time the plane supposedly went down and we didn't see anything, I suspect this was a false alarm or they got the position wrong. We made between 4 and 5 knots under sail for the entire trip from Lake Worth to the Biscayne Channel entrance. Seas were 1 foot or less on a 4 to 5 second period, and that made for a fairly comfortable sail. It was nice to finally make significant progress without the aid of diesel. We did fire up an engine briefly to help us negotiate the channel. 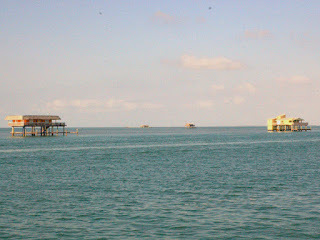 We passed by the stilt houses and into the Bay. 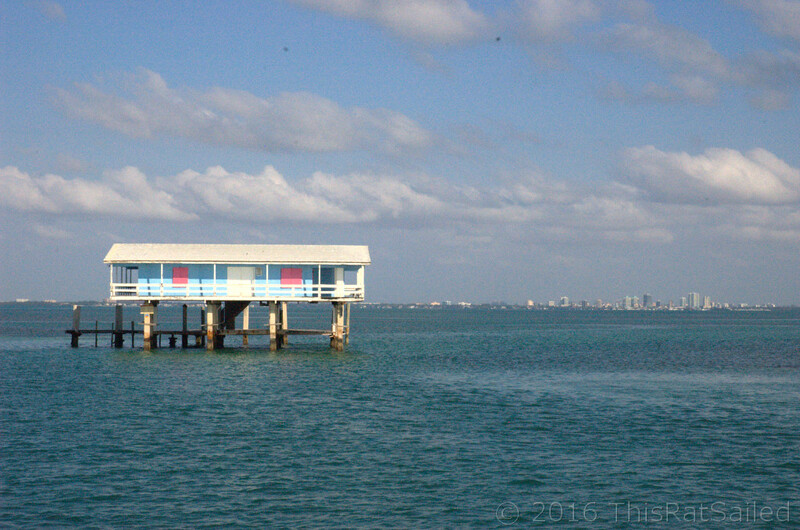 A Stiltsville building with Miami in the background. 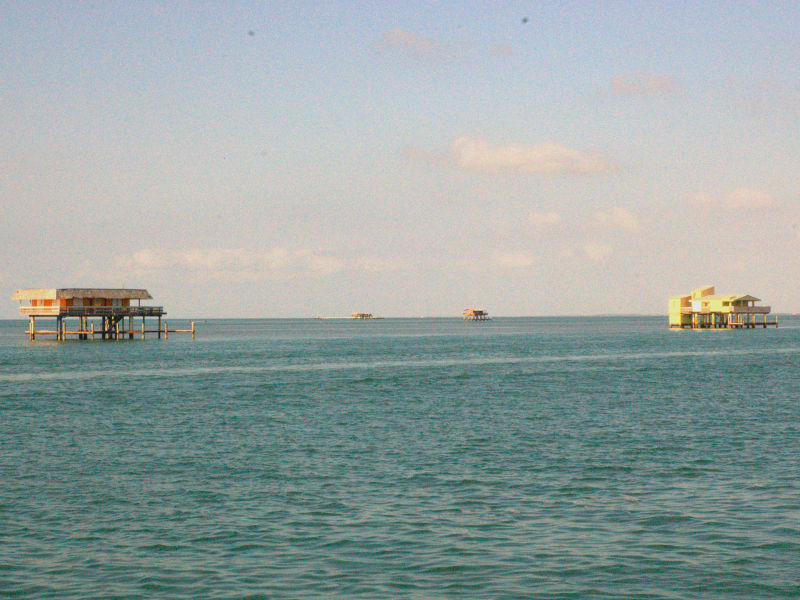 We continued our way south and anchored just off Elliott Key early in the afternoon. We were about 3/4 of a mile away from the key in 6 feet of clear water. We dropped the dinghy into the water and went over to check out the dock and ranger station on the key. It was deserted except for the millions of mosquitoes that make it home. The signs say you can camp there for a $25 fee...but I don't think I'd pay to feed the mosquitoes all night. Camping here does come with a luxury though; they have restrooms with running water and even cold water showers. When you live on a boat with a small holding tank, you take advantage of restrooms when you find them. After we decided that we fed enough mosquitoes, we headed back to the boat. We swam in the clear water around the boat, and even got out a bit of soap for an impromptu bath. Enjoyed a beer while sitting on the bow of the boat as dusk approached. Anchored this far away from the key gave us a nice breeze, and the mosquitoes didn't come out to visit. Glad you finally had a nice evening. 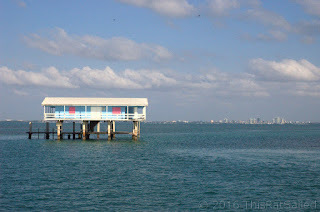 We love Biscayne Bay and Elliot Key! Glad we did too. Could use a few more of them. Hope you have a chance to stop and visit Boca Chita on the way back north. There's a neat little harbor and a lighthouse and a nice park there. It's just north of Elliott. Unfortunately pets are not allowed so we probably won't stop there.